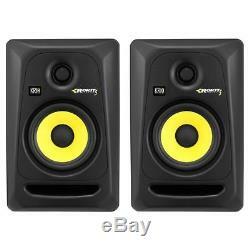 KRK Rokit RP5 G3 Powered Studio Monitor - Pair. KRK Systems have been leading the studio speaker monitor industry for over a decade now thanks to their unprecedented audio quality and precision engineering. Introducing the 3rd generation of KRK Rokit RP5 speakers, these have been designed to deliver a level of accuracy and performance that's unmatched in this class, ideal for the modern, competitive engineer or producer. Not only do you get a larger headroom, adjustable frequencies and low distortion over previous generations but the build quality is also top notch with clear mids and a tight bass response. This remarkable level of detail comes at an excellent price point that's incredibly affordable and within reach of any serious hobbyist. KRK ROKIT MONITORS - GENERATION 3. KRK Systems is one of the world's most respected manufacturers of studio reference monitors. In their state of the art design facility, KRK engineers create products that deliver natural and balanced spectral response with low distortion and superior imaging. KRK Studio Monitors have been the professional's choice of recording engineers and artists for mixing and mastering hit records around the globe, as they need to hear every nuance of the audio being reproduced. KRK ROKIT Generation 3 monitors continue in this design philosophy, so regardless of your musical style, genre, or particular mixing needs, KRK Rokits deliver. ROKIT 5 Powered Monitor - Generation 3. KRK's ROKIT 5 G3 (Generation 3) powered studio monitors offer professional performance and accuracy for recording, mixing, mastering and playback. The system consists of a 1" soft dome tweeter and 5" glass-Aramid composite woofer. The front-firing bass port reduces boundary coupling to allow flexible positioning in the room while the engineered surface reduces diffraction distortion. Multiple input connections ensure the ROKIT 5 G3 will easily integrate in any system configuration. As one of the most used Studio monitors in the world, the ROKIT 5 is a high valuable and compact solution towards an accurate mix. KRK ROKIT 5 G3 Features. Bi-amped, class A/B amplifier offering large headroom and low distortion. Proprietary waveguide optimized for superior imaging. 1 Soft-dome tweeter provides pristine clarity and extended response up to 35kHz. High-frequency adjustment tailors the system to personal taste. Lightweight, glass-Aramid composite woofer delivers clear midrange and tight bass. Low-frequency adjustment tailors the monitors to taste and adjusts for room acoustics. Front Firing Port - Low-frequency extension while reducing boundary coupling. Radiused edges reduce distortion from diffraction. Low-resonance enclosure for minimized distortion and colorization. Multiple audio input connectors (XLR, ¼, RCA) for universal connectivity in any studio environment. Factory installed foam pad provides isolation between the speaker and surface. Frequency Response 45Hz - 35kHz (+/- 2 dB). KRK ROKIT 5 G3 Technical Specifications. System type: Active Studio Monitor. Low-Frequency: 5 Aramid Glass Composite woofer. High-Frequency: 1 soft dome tweeter. Frequency Response: 45Hz - 35kHz. Max Peak SPL: 106 dB. Input Impedance (Ohms): 10 K Ohm balanced. HF Level Adjust: -2dB, -1dB, 0, +1dB. System Volume: (-30dB - +6dB). Port Configuration: Front firing slot port. Dimensions (D x W x H): 9.06" (230mm) x 7.28" (185mm) x 11.10 (282mm). Weight: 14.1 lbs (6.4 kg). Rich Tone Music Ltd 64-82 Broadfield Road. Tel: 0114 362 77 77. VAT Number: 870 3855 09. The item "KRK Rokit RP5 G3 Powered Studio Monitor Pair" is in sale since Wednesday, November 14, 2018. This item is in the category "Sound & Vision\Performance & DJ Equipment\Speakers & Monitors". The seller is "richtonemusic" and is located in Sheffield. This item can be shipped to United Kingdom.